Wycombe have signed former Gillingham defender Leon Johnson. The 26-year-old was released by Gills manager Ronnie Jepson at the end of last season and has agreed a two-year contract at Adams Park. Johnson began his career with Southend and made over 60 appearances for the Roots Hall outfit before moving to Priestfield in August 2002. 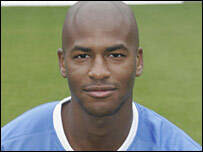 He played over 100 games for the Gills mostly in the centre of defence but made a few appearances at left-back. Johnson is Wycombe boss Paul Lambert's fifth new signing of the summer. Lambert is still waiting to see if St Mirren striker John Sutton will accept an offer, while talks are ongoing with QPR over a possible move for Tommy Doherty.